NOT KNOWING THIS MIGHT EMBARRASS YOU SOMEDAY. SO BUCKLE UP NOW ! Every law student refer to various judgements every now and then. Some are Indian Judgements and some are of other legal system. But how to read a legal citation? Knowing how to read and write case citations is an imperative skill for everyone studying law. This article may help you with understanding of the basic elements. The complexity may be varied but this level of understanding is adequate for most of us. How to read a simple case citation ? Sometimes for a particular case there may be more than one citations. These are called Equivalent Citations or Parallel Citations. Generally AIR, SCC, SCR, JT and SCALE are used to refer cases but there are more. Here our previous knowledge won’t help. Lets learn some more Abbreviations. Here O.A. and C.S. or A. No. are Case Types or Types of Cases. By referring the list we will come to know that O.A. means Original Application, C.S. means Civil Suit and A.No. means Application No. ORIGINAL SIDE APPEAL : O.S.A. SPECIAL TRIBUNAL APPEAL : S.T.A. CIVIL MISCELLANEOUS APPEAL : C.M.A. CIVIL MIS.SECOND APPEAL : C.M.S.A. LETTERS PATENT APPEAL : L.P.A. SPECIAL TRIBUNAL PETITION : S.T.P. TRADE MARKS APPEAL : T.M.A. TRADE MARKS SECOND APPEAL : T.M.S.A. TAX CASE APPEAL : T.C.A. 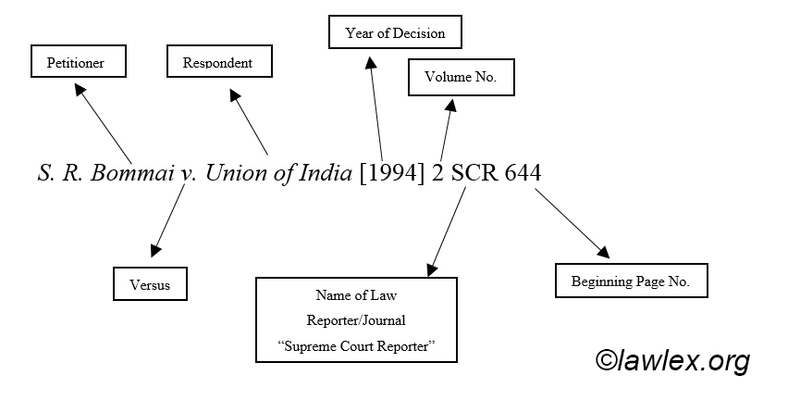 TAX CASE REVISION : T.C.R. REFERRED CASE PETITION : R.C.P. CIVIL REVISION PETITION : C.R.P. Note: For all cases filed in Madurai Bench, the letters ‘MD’ shall be added in Brackets along side the respective abbreviations. HABEAS CORPUS PETITION : H.C.P. CRL. REVISION CASE : CRL. R.C. CRIMINAL ORIGINAL PETITION : CRL. O.P. REVIEW APPLICATION : REV. APPL. TESTAMENTARY ORIGINAL SUIT : T.O.S. Did you find this article useful ? Then share it with your friends. If you want to add some more information leave a comment below.